This is a glorious moment; this is also a solemn moment full of hope. I thank our distinguished guests, who have come here from afar, as well as those friends from around the world who love democracy and care about Taiwan, for sharing this glorious moment with us. We are here today, not just to celebrate an inauguration, but to witness the flowering of hard-won democratic values and the dawn of a new era. On the eve of the 21st century, the people of Taiwan have completed a historic alternation of political parties in power. This is not only the first of its kind in the history of the Republic of China, but also an epochal landmark for Chinese communities around the world. Taiwan has not only set a new model for the Asian experience of democracy, but has also added an inspiring example to the third wave of democracy the world over. The election for the 10th-term president of the Republic of China has clearly shown the world that the fruits of freedom and democracy are not easy to come by. Twenty-three million people, through the power of determined will, have dispelled enmity with love, overcome intimidation with hope, and conquered fear with faith. With our sacred votes we have proved to the world that freedom and democracy are indisputable universal values, and that peace is humanity's highest goal. The outcome of Taiwan's year 2000 presidential election is not the victory of an individual or a political party. It is a victory of the people as well as a victory for democracy, because we have, while attracting global attention, transcended fear, threats and oppression and bravely risen to our feet together. Taiwan stands up, demonstrating a firm insistence on reason and a sturdy faith in democracy. Taiwan stands up, representing the self-confidence of the people and the dignity of the country. Taiwan stands up, symbolizing the quest for hope and the realization of dreams. Dear compatriots, let's always remember this moment; let's always remember to value and feel gratitude for it, because the fruits of democracy did not come out of the blue. We reaped the fruits only after we had been subjected to many perils and countless hardships. If not for the fearless sacrifice of our democratic forebears, if not for the unswerving faith of the tens of millions of Taiwanese people in freedom and democracy, we could not possibly be standing on our beloved land today and celebrating a glorious occasion that belongs to all the people. Today, it is as if we are standing before a fresh new gate of history. In the process of democratization, the Taiwanese people have created a brand-new key to our shared destiny. The new century's gates of hope are soon to open. We are humble but not submissive. We are full of self-confidence but do not have the slightest bit of complacence. Since that moment on March 18 when the election results came to light, I have accepted the mandate of all Taiwanese people in a most earnest and humble frame of mind, and have vowed to devote all my heart, knowledge and courage to assuming the heavy responsibility for our country's future. I personally understand that the significance of the alternation of political parties and of the peaceful transition of power lies not in that it is a change of personnel or political parties. Nor in that it is a dynastic change. Rather, it is the return of state and government power to the people through a democratic procedure. The country belongs to the people, rather than to any individual or political party. The government and its officials, from the head of state down to the rank-and-file employees, exist for the service of the people. The alternation of political parties does not mean an across-the-board negation of the past. We should be fair in evaluating the contributions made by those in power throughout the ages. Mr. Lee Teng-hui deserves our highest tribute and heartfelt gratitude for his promotion of democratic reforms and for his excellent performance during his twelve years of leadership. Taiwan society has rallied and participated energetically in the election. Despite the diverse views and stances, all individuals share the same commitment--to come forward for the sake of their political ideas and the country's future. We believe that the end of an election is the beginning of reconciliation. After the curtain falls on emotional campaigns, rationality should prevail. Under the supreme principles of national interest and the welfare of the people, those in power and in opposition should both fulfill their mandates given by the people and realize the ideals of fair competition in multiparty politics, as well as the checks and balances of democratic politics. A democratic society with fair competition, tolerance and trust is the strongest impetus for a nation's development. Placing national interests above those of political parties, we should solidify the will of the people and seek consensus among the ruling and opposition parties, to promote the country's progress and reforms. "A government for all people" and "rule by the clean and upright" are promises I made to the people during the campaign period. They are also Taiwan's key to stepping over its fault lines and rising to a higher level in the future. The spirit of "a government for all people" lies in the fact that "the government exists for the people." The people are the masters and shareholders of the state. The government should rule on the basis of majority public opinion. The interests of the people should reign supreme over those of any political party or individual. I have always taken pride in being a member of the Democratic Progressive Party, but from the moment I take my oath and assume the presidency, I will put all my efforts into fulfilling my role as a "president for all people." As in the formation of the new government, we recruit people according to their talents and do not discriminate on the basis of ethnicity, gender or party affiliation. The welfare of the populace shall be our primary goal in the future. "Rule by the clean and upright" has as its topmost priority the elimination of "black gold"--the involvement of organized crime and moneyed interests in politics--and the eradication of vote-buying. For a long time, the Taiwanese people have been deeply repelled by moneyed politics and the interference of organized crime. Vote-buying in grassroots elections has also robbed the people of their right to elect the wise and the able, and tainted the development of Taiwan's democracy. Today, I am willing to promise hereby that the new government will eliminate vote-buying and crack down on "black gold" politics, so that Taiwan can rise above such sinking forces and ensure rule by the clean and upright. We must give the people a clean political environment. In the area of government reforms, we need to establish a government that is clean, efficient, far-sighted, dynamic, highly flexible and responsive, in order to ensure Taiwan's competitiveness in the face of increasingly fierce global competition. The age of "large and capable" governments has now passed, replaced by one of "small and effective" governments, which have established partnership relations with the people. We should accelerate the streamlining of government functions and organization and actively expand the role of public participation. This will not only allow the public to fully utilize its energy but also significantly reduce the government's burdens. Similar partnership relations should also be set up between the central and local governments. We want to break the authoritarian and centralized control over both power and money. We want to realize the spirit of local autonomy, where the local and central governments share resources and responsibilities, where "the central government will not do what the local governments can." Whether in the east, west, north or south, or whether on Taiwan proper or on offshore islands, all will enjoy balanced, pluralistic development, and the gap between urban and rural areas will be reduced. We should understand that the government is no panacea for all ills. The driving force for economic development and societal progress is the people. Over the past half-century, the Taiwanese people have toiled hard to create an economic miracle that has won global applause, and to lay the foundation for the survival and development of the Republic of China. Today, facing the impact of the fast-changing information technologies and trade liberalization, Taiwan must move toward a knowledge-based economy. High-tech industries need to be constantly innovative, while traditional ones have to undergo transformation and upgrading. In the future, the government should not necessarily play the role of a "leader" or "manager." On the contrary, it should be the "supporter" and "service provider," as expected by private enterprises. The responsibility of a modern government is to raise administrative efficiency, improve the domestic investment environment, and maintain financial order and stock market stability, so as to allow the economy to move toward full liberalization and globalization through fair competition. Based on these principles, the vitality of the public will naturally bloom and create a new phase in Taiwan's economic miracle. Apart from consolidating democratic achievements, promoting government reforms, and raising economic competitiveness, the new government should, as its foremost objective, closely watch the public opinion and implement reforms accordingly, so that the people on this land can live with more dignity, greater self-confidence and a better quality of life. Let our society not only be safe, harmonious and prosperous, but also follow the principles of fairness and justice. As we cultivate the ever-growing abilities of our citizens, we will let our next generation learn in an environment filled with happiness and hope. The 21st century will be a time when "the right to a quality life" and "a refined way of life" are much emphasized. The government will find solutions for issues relating to the people's lives, such as law and order, social welfare, environmental protection, land-use planning, waste disposal, river cleaning, transportation and community renewal. It will also have to implement these solutions thoroughly. At present, we need to immediately improve law and order and environmental protection, two important indicators of the quality of life. We will build a new social order so that the people may live in peace without fear. A balance must be ensured between nature conservation and economic development so that Taiwan may develop into a sustainable green silicon island. Judicial integrity is the bulwark of political democracy and social justice. An impartial, independent judiciary is a protector of social order and a defender of the people's rights. At present, we still have a long way to go in our judicial reforms. Our compatriots must continue to keep close watch over the judiciary and voice their expectations. At the same time, we should also restrain our administrative power and give the judiciary room to operate independently and without interference. Humans are Taiwan's most important resources. Talented people hold the key to the country's competitiveness, while education is a long-term cause for "accumulating wealth among the people." We will soon seek a consensus among the ruling and opposition parties, academia and the public so as to carry on with educational reforms and build a healthy, proactive, lively and innovative educational system, which will allow Taiwan to cultivate an uninterrupted stream of top-notch talents amid the fierce international competition. We will let Taiwan move gradually toward being a "learning organism" and a "knowledge-based society." We will also encourage people to take up lifetime learning to fully develop their potential and creativity. Grassroots community organizations are now developing around the country, working to explore and preserve the history, culture, geography and ecology of their localities. These are all part of Taiwan culture, whether they are local cultures, mass cultures or high cultures. Due to special historical and geographical factors, Taiwan possesses a wealth of diversified cultural elements. But cultural development is not something that can bring immediate success. Rather, it has to be accumulated bit by bit. We must open our hearts with tolerance and respect, so that our diverse ethnic groups and different regional cultures may communicate with each other, and so that Taiwan's local cultures may connect with the cultures of Chinese-speaking communities and other world cultures, and create a new milieu of "a cultural Taiwan in a modern century." The September 21 earthquake that struck last year brought to our land and our compatriots an unprecedented catastrophe, the pain of which is yet to heal. The new government will brook no delay in the reconstruction of disaster areas, including industrial and spiritual recovery. We will not cease until the last victim is taken care of and the last destroyed place is rebuilt. Here, we would like to express our highest respect again for all individuals and nongovernmental organizations that have selflessly lent a hand to the rescue and reconstruction work after the disaster. Amid the fierce power of Nature, we have seen Taiwan's most beautiful compassion, strongest faith and greatest trust. Our compatriots have been injured by the September 21 earthquake, but with the spirit of a "volunteer Taiwan," Taiwan's new family will stand up resolutely on its feet once again. Dear compatriots, 400 years ago Taiwan was called "Ilha Formosa"--the beautiful island--for its lustrous landscape. Today, Taiwan is manifesting the elegance of a democratic island, once again attracting global attention, as the people on this land create a new page in our history. We believe that the Republic of China, with its democratic achievements and technological and economic prowess, can certainly continue to play an indispensable role in the international community. In addition to strengthening the existing relations with friendly nations, we want to actively participate in all types of international nongovernmental organizations. Through humanitarian care, economic cooperation, cultural exchanges and various other ways, we will actively participate in international affairs, expand Taiwan's room for survival in the international arena, and contribute to the welfare of the international community. Besides, we are also willing to commit a more active contribution in safeguarding international human rights. The Republic of China cannot and will not remain outside global human rights trends. We will abide by the Universal Declaration of Human Rights, the International Convention for Civil and Political Rights, and the Vienna Declaration and Program of Action. We will bring the Republic of China back into the international human rights system. The new government will urge the Legislative Yuan to ratify the International Bill of Rights as a domestic law of Taiwan, so that it will formally become the "Taiwan Bill of Rights." We hope to set up an independent national human rights commission in Taiwan, thereby realizing an action long advocated by the United Nations. We will also invite two outstanding nongovernmental organizations, the International Commission of Jurists and Amnesty International, to assist us in our measures to protect human rights and make the Republic of China into a new indicator for human rights in the 21st century. We firmly believe that at no time, nor in any corner of the world, can the meaning and values of freedom, democracy and human rights be ignored or changed. The 20th century left us with a major lesson--that war is a failure of humanity. Waged for whatever lofty purposes or high-sounding reasons, war is the greatest harm to freedom, democracy and human rights. Over the past one hundred plus years, China has suffered imperialist aggression, which left indelible wounds. Taiwan has had an even sadder fate, tormented by brute force and colonial rule. These similar historical experiences should bring mutual understanding between the people on the two sides of the Taiwan Strait, setting a solid foundation for pursuing freedom, democracy and human rights together. However, due to the long period of separation, the two sides have developed vastly different political systems and ways of life, obstructing empathy and friendship between the people on the two sides, and even creating a wall of divisiveness and confrontation. Today, as the Cold War has ended, it is time for the two sides to cast aside the hostility left from the old era. We do not need to wait further because there is a new opportunity now for the two sides to create an era of reconciliation together. The people on the two sides of the Taiwan Strait share the same ancestral, cultural, and historical background. While upholding the principles of democracy and parity, building upon the existing foundations, and constructing conditions for cooperation through good will, we believe that the leaders on both sides possess enough wisdom and creativity to jointly deal with the question of a future "one China." I fully understand that, as the popularly elected 10th-term president of the Republic of China, I must abide by the Constitution, maintain the sovereignty, dignity and security of our country, and ensure the well-being of all citizens. Therefore, as long as the CCP regime has no intention to use military force against Taiwan, I pledge that during my term in office, I will not declare independence, I will not change the national title, I will not push forth the inclusion of the so-called "state-to-state" description in the Constitution, and I will not promote a referendum to change the status quo in regard to the question of independence or unification. Furthermore, there is no question of abolishing the Guidelines for National Unification and the National Unification Council. History has proved that war will lead to more hatred and enmity, without the least help to the development of mutual relations. Chinese people emphasize the difference between statesmanship and hegemony, believing in the philosophy that a government which employs benevolence "will please those near and appeal to those from afar," and "when those from afar will not submit, then one must practice kindness and virtue to attract them." Such Chinese wisdom will remain a universal value. 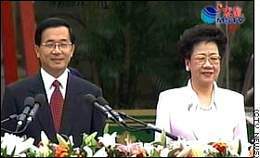 Under the leadership of Mr. Deng Xiaoping and Mr. Jiang Zemin, the mainland has created a miracle of economic openness. In Taiwan, over a half century, not only have we created a miracle economy, we have also created the political marvel of democracy. On such a basis, as long as the governments and people on the two sides of the Taiwan Strait can interact more, following the principles of "goodwill reconciliation, active cooperation, and permanent peace," while at the same time respecting the free choice of the people and excluding unnecessary obstacles, both sides of the Strait can make great contributions to the prosperity and stability of the Asia-Pacific region. Both sides will also create a glorious civilization for humanity. Dear compatriots, we hope so much to share the moving scene of this moment with all Chinese-speaking people around the world. The wide Ketagelan Boulevard before us was bristling with security guards only a few years ago. The building behind me used to be the Governor General's Mansion during the colonial era. Today, we gather here to extol the glory and joy of democracy with songs of the land and the voice of the people. Authoritarianism and force can only bring surrender for one time, while democracy and freedom are values that will endure forever. Only by adhering to the will of the people can we pioneer the paths of history and build enduring architecture. Today, as the son of a tenant farmer with a poor family background, I have struggled and grown on this land and, after experiencing defeat and tribulation, I have finally won the trust of the people to take up the great responsibility of leading the country. My individual achievements are minor, but the message is valuable because each citizen of Formosa is a "child of Taiwan" just like me. In whatever difficult environment, Taiwan will be like a selfless, loving mother, who never stops giving her children opportunities and who helps them realize beautiful dreams. The spirit of the "child of Taiwan" reveals to us that even though Taiwan, Penghu, Kinmen and Matsu are tiny islands on the rim of the Pacific, the map of our dreams knows no limits. The map extends all the way to the horizon as long as our 23 million compatriots fear no hardship and move forward hand in hand. Dear compatriots, this magnificent moment belongs to all the people. All grace and glory belongs to Taiwan--our eternal Mother. Together, let's extend our gratitude to the earth and our respect to the people. Long live the people of Taiwan. We pray for the prosperity of the Republic of China, and for the health and happiness of all compatriots and all our distinguished guests!